I feel fortunate at a restaurant that has one option with no salt, fat or sugar that I can order. So imagine how much I love a local hotspot here in the northern suburbs of Chicago, Dengeo’s. The Dengeo’s in Skokie (there’s another in Buffalo Grove) has grown from a hot dog stand to a quick serve restaurant—order at the cash registers and wait for your food to be done at the pickup counter. My favorites at Dengeo’s used to be the gyros and the hamburgers and hot dogs. Those are all off my diet these days, but thankfully Dengeo’s comes through for me with a chicken breast dinner plate that features two meaty breasts in a lemon/olive oil dressing. Rather than get the French fries, I ask for a salad as a side and get a large bowl of salad, not some little skimpy offering. Dengeo’s tilapia dinner with a salad instead of fries. Dengeo’s new fillet steak kabobs. 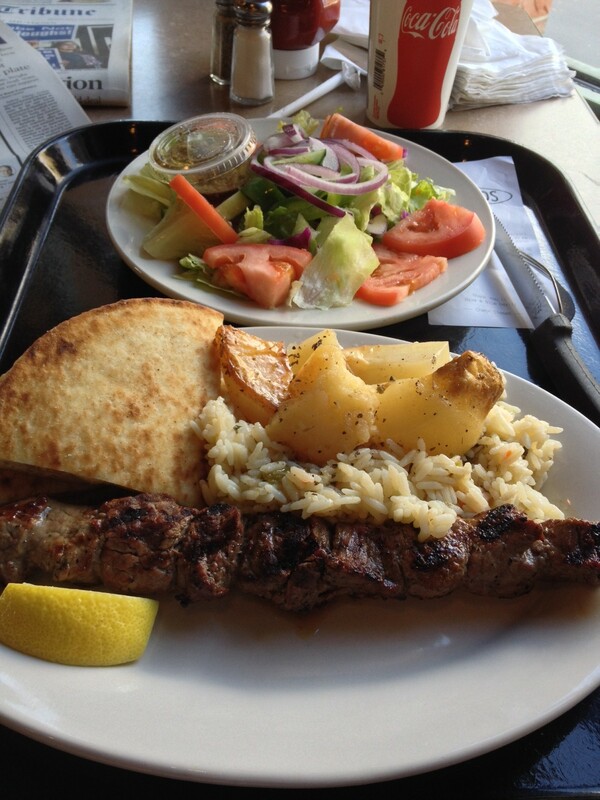 Leave the rice and pita, eat the potatoes and salad. Dengeo’s also has been adding new entrees I can order. 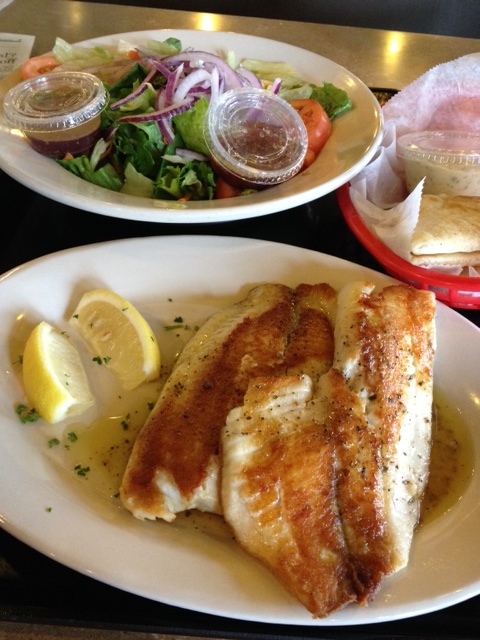 It’s tilapia dinner plate features two large fillets and again can be ordered with a salad rather than some unhealthy side. Recently, Dengeo’s also added a fillet mignon kabob offering. The steak was tasty but the rice worries me a bit, so this is an occasional treat now. Thanks Dengeo’s for showing a local restaurant can offer healthy dishes. Dengeo’s was a great favorite of mine, back when I worked in Lincolnwood/Skokie. Your article touches upon, but doesn’t state exclusively, that Dengeos’ ability to offer healthier options is tied directly to the fact that it is a local, 2-shop company. The economics of a big national change, whose products must appeal to diverse populations spread literally from sea-to-sea (and sometimes beyond) require fatty, salty flavors that have the broadest possible appeal. Dengeos just has to please you, and me, and people like us who live on the Chicago’s north side, or the people like us who live in the suburbs.